The Edinburgh Festival Fringe guide arrived in my mailbox today. It has 332 pages of listings of nearly 3,000 shows, with a venue guide and index close to 50 pages. It’s bigger than the old phone books of many towns. And it’s all entertainment. My listing is on page 255, which is the second page of the theatre section. 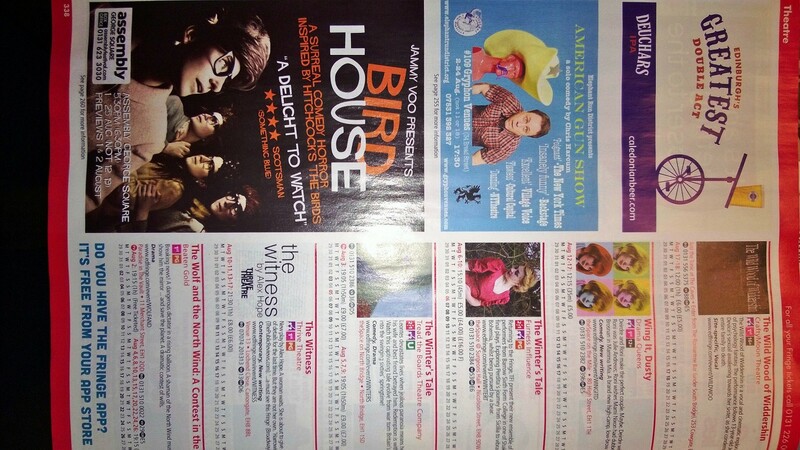 My 1/8 page ad (pictured here) is on p. 338, next to the listings for Wing It, Dusty and The Winter’s Tale. I will be pouring over these pages to see which shows to see. I need to figure out which queues to flyer (in America you say “which lines to busque”). Then, I’ll see which shows my be potential friends or allies. It’s usually not the ones I expect. People/shows represent differently in the literature than they do in life. Some are pleasant surprises. Others are not. It is both surreal and cool. It’s also exciting and terrifying. Just skimming the pages, there’s a certain exuberance I can’t quite quantify on the pages. There’s a sensibility there that is both fun and at a high level. There’s energy under the listings and the advertisements. Seeing this together, I feel like a small fish jumping into a big pond in spite of putting up work in NYC for the last 10 years. There’s a lot of stuff to prep for this beyond simply rehearsing the piece. My to-do list is really long. Longer than it has been for any previous show I’ve created. Sometimes the producing can be a great distraction from creating the work. It’s a good way to keep yourself occupied. Or a way to short-change the most important part. But then I think, “but if no one comes to see it, what’s the point?” I think that’s where a lot of people make shows about outrageous things in order to get attention. And a lot of good artists become bitter because working on the piece itself is never enough. It’s my first time performing at this festival. It’s a big investment in time, money, energy, and fortitude. They say it takes three trips there to make an impact with both the audiences and the global presenters in attendance. The feeling I have right now is like being thrown in the deep end of the pool and my instinct is to start flailing my arms around when it’s far better to stay still, let myself drift to the bottom and float back up. Then I can learn to swim. But my inner child wants to do triple back flips off the high dive. I stand by my show. It did well in it’s earlier incarnation Two Lovely Black Eyes. I have to remind myself of that until the pieces come together and I get in front of an audience again. It plays July 25 at 9 p.m. and July 26 and 27 at 7 p.m. at 59 E 59 in NYC. Please come see it if you’re in town. It play Aug. 2 to 24 (no show Aug. 11 or 18) at the Gryphon 2 in Edinburgh. Please see it twice if you’re there. If you can’t do either and want to support this effort, please consider donating to our Indiegogo campaign. I deeply, deeply appreciate it. I’ll keep you posted on how things develop.